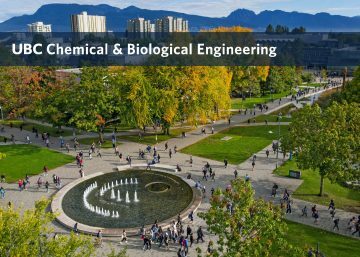 The Department of Chemical & Biological Engineering at the University of British Columbia offers Master of Applied Science (MASc), Master of Science (MSc) and Doctor of Philosophy (PhD) programs for those wishing to further their studies. The deadline for Fall 2018 admission is December 31st, 2017 and we encourage students considering graduate school to apply. UBC is a world-class research institution and is located in beautiful Vancouver, British Columbia (consistently voted in the top 5 most livable cities in the world). All accepted students will receive a stipend and top applicants will be automatically be considered for stipend supplements (typically around $5000) during the first year. International students may also receive an additional tuition supplement (entrance award). For more information, please email chbe.gradoffice@ubc.ca.